The POE-162S is the IEEE 802.3at High Power over Ethernet Splitter that can split the 52 ~ 56V DC over the Ethernet cable into selectable 12V or 24V DC power output. It is designed specifically to meet the growing demand for higher power required network equipment such as PTZ (Pan, Tilt & Zoom) network cameras, PTZ speed dome camera, color touch-screen / video and voice over IP (VoIP) telephones, multi-channel (11a / b / g / n) wireless LAN access points and other network devices that need to work normally by higher power feeding than power via current IEEE 802.3af PoE standard. 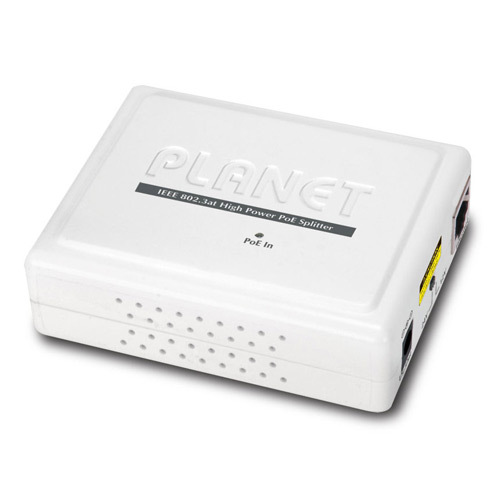 The POE-162S High Power Splitter is an ideal solution to transfering power to the network device with high power demand directly via the RJ-45 port interface without the need to install power outlets and electrical cabling. The POE-162S (Splitter) can work with the IEEE 802.3at Gigabit Power over Ethernet devices like the POE-161, High Power PoE Switch and Media Converter (Injector, insert DC voltage into Cat.5/5e/6 cable) to transfer data and power simultaneously into the end device. The POE-161, High Power Switch and Media Converter, can combine the Ethernet digital data with power over the twisted pair cables as an IEEE 802.3at Gigabit Power over Ethernet Injector. The POE-162S separates the digital data and the power into 12V / 24V DC power outputs. The maximum distance between the high power PoE injector and the splitter (POE-162S) is 100 meters. Unlike the current Power over Ethernet Splitter, the POE-162S also supports passive 10/100/1000Mbps Ethernet connection ability. With IEEE 802.3at Gigabit High Power over Ethernet devices installed, the system administrator only has to use one single RJ-45 Ethernet cable to carry both power and data to each device. Besides, to connect through the high power PoE injector and the POE-162S, you could also have benefits including cost saving, easier for networking planning and higher reliability. Upon IEEE 802.3at compliant devices are installed, the high power PoE injector working together with the POE-162S can make the connection while migrating or splitting the power and the Ethernet digital packets. Due to the capability of IEEE 802.3at standard, the POE-162S can co-work with the IEEE 802.3at Gigabit PoE injector devices like POE-161, High Power Switch or High Power Media Converter and transform non-PoE equipment to IEEE 802.3at PoE application. For a place which is hard to find the power inlet, the High Power PoE devices and the POE-162S operate as a pair. It provides the easiest way to power your Ethernet devices that need high power input, such as PTZ (Pan, Tilt & Zoom) network cameras, PTZ speed dome camera, color touch-screen voice over IP (VoIP) telephones, and multi-channel wireless LAN access points. Power Output	 12V DC, 2A max.